PALEO JAY SMOOTHIE CAFE: pqtd 132 Stay AWAY from your Doctor! pqtd 132 Stay AWAY from your Doctor! These two things will do more harm to your health than good, and are symptomatic of the evil that has been done to our society. I hope you know by now, from listening to this podcast and others about Paleo and Ancestral health, that a low fat, grain and sugar based diet is slow suicide. This way of eating, coupled with an idea that more movement and activity and less calories will somehow save you from modern diseases, is delusional. You need real foods: God made foods- fats, pastured meats and dairy, seafood like sardines, and tons of vegetables with a few fruits thrown in will build your health from the inside out! Keep it up, and you won’t need medical doctors and clinics, and actually, as in days of old, you should avoid them like the plague whenever you can. 1. Avoid mammograms- women that get this test get more breast cancer, just from the radiation of the test itself! And, if you do the breast exam by yourself, and go to the clinic, they will usually recommend drastic treatment unnecessarily, such as breast removal, although that is usually totally unnecessary. 2. Pelvic exams are likewise counterproductive and unneeded. 3. Cervical Cancer screenings are also not productive, or indicative of disease. 1. Prostate exams are basically meaningless- most older men would find a positive PSA reading, but it is meaningless- these men will die of something else long before the prostate fails. Keep your levels of vitamin D up, and you should have no problems! 2. Stent surgery- Again, if you show up at the doctor’s, he will probably recommend a stent, to “prop open” the blood vessels that are said to be closing. In most cases, this is totally unnecessary, and could easily be achieved by blood thinning medications instead. 1. Colonoscopies are totally not needed in the majority of cases, and if you do have a fetal occult blood test (way less expensive and dangerous) at age 50 instead, you don’t need another one ever. 2. Bypass surgeries are in the same ballpark as Stent surgery- most are done for profit, not out of need! They are basically a band-aid anyway- nothing will clear your arteries but a truly healthy diet very low in grains and sugars! YOUR HEALTH IS UP TO YOU! You and your body- your body repairs and heals you, NOT DOCTORS! SO, step up. 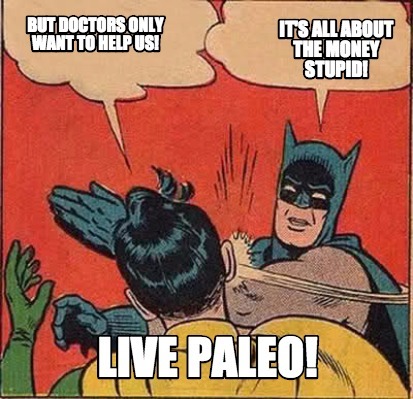 Do what you need to do, by eating in a natural, evolutionarily correct manner, exercising as would a cave person via Perfectly Paleo Exercise, and above all stay away from the Doctor’s office! This is what our parents did, our grandparents did, and so on, back into time. It worked for them, and it will work for us. Build Yourself into a Diesel! PJSC podcast #134- Heroic Fiction is Paleo Too!